By Piotr Małek and Bogna Haponiuk. Our percent off calculator helps you determine how much will you save during a sale, when the whole merchandise is "X percent off!". Keep on reading - if you don't know how to figure out percentages, this calculator will surely save you a lot of trouble. Actually, "percent off" and a discount are the exact same thing. Imagine it's Black Friday and all goods in a certain store are 75% off. Our sale calculator will figure out how much money stays in your pocket! Enter the original price into our percent off calculator. For example, a TV set might cost $5000. Determine the percentage discount - for instance, 75%. The sum that stays in your pocket - your savings - is simply these two values multiplied by each other: 75% * $5000 = 0.75 * $5000 = $3750. The final price of the product on sale is the difference between the original price and savings: $5000 = $3750 = $1250. 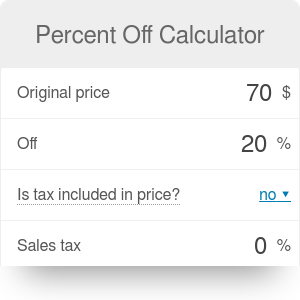 You can also use the percent off calculator to determine how much more you have to pay if the price of the product goes up! Simply type a negative value into the "off" box - our calculator will use the percentage increase formula. Make sure to check out our commission calculator if you're interested in the salesperson's fee as well. Piotr Małek and Bogna Haponiuk. Percent Off Calculator can be embedded on your website to enrich the content you wrote and make it easier for your visitors to understand your message.